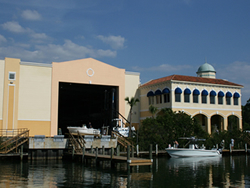 Bellagio (Osprey, Florida): A World Class dry rack boat storage building, with highly detailed, quality Architectural treatments served by state-of-the-art lifting equipment. Golden Giant has been in the metal building construction industry since 1971 as a manufacturer of all steel buildings. The co-founder and current owner Gene Good has evolved the business from a primarily agricultural based company to a designer, manufacturer, and builder of all steel buildings. We have the capability and experience to construct a variety of different metal structures including commercial buildings, industrial buildings, boat storage marina design, mini storage units, churches and aviation hangars. 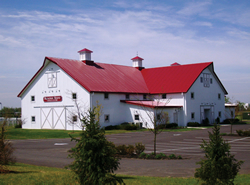 The entire building is manufactured in our 120,000 square foot facility located in Kenton, Ohio. Our services and specialty in the metal building industry is custom designing buildings as unique as our customers. When you work with Golden Giant Building Systems you work directly with the designer, manufacturer, and builder of your project. Having our marketing, engineering, and manufacturing departments under one roof allows us to be extremely flexible with building and shipping schedules. Metal building construction specifications throughout the country are becoming more stringent. Seismic, wind and snow conditions are factors that must be addressed with every building. Golden Giant has certified engineers on staff to address these challenges with our steel building systems.